So, I don’t know about you guys, but I spend a lot of time online. I mean a lot. 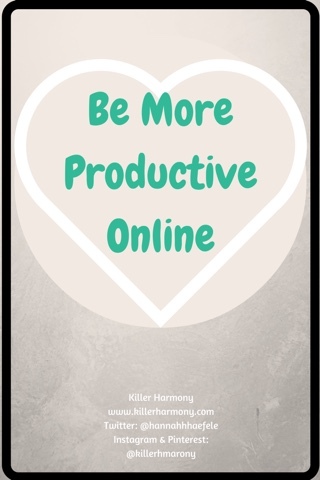 As a blogger, I need to be online a lot, and I also need to be productive online. I have had a lot of experience working online and keeping on track with what I had to do. Not only have I been blogging for a while, but I have also had more than my fair share of online classes. Through the different semesters, I have learned how to make the time I spend online as productive as possible. *Side Note: I realize that not all of your time online is going to be productive. The internet is a beautiful thing, and it is okay to spend time looking at funny text posts or watching cat videos. If you want to learn more about my tips for being productive when you are online working on school work or an online job, then keep on reading! Tip #1: Limit your open tabs. It is very hard to keep focused on something when you have tons of different tabs open with Facebook, Twitter, YouTube… You need to limit your open tabs to what is absolutely necessary. I’m not saying you can only have one tab open. You might need a couple tabs to reference different articles for a research paper you are working on. If you are working on something for an art class, you might need to have a couple of tabs open with information and pictures. When I was writing this post, I had (obviously) my blog composer tab open. I also had my Google calendar open (it is my editorial calendar). I also like to have something (usually music) on in the background on YouTube. If I am working on the final touches of a post, I will also have a tab open for the design program Canva where I make all of my graphics and maybe a photo editor if the post needs some photos. Tip #2: Track your time. I know that there are apps you can download to keep track of time, but I usually just wing it. I think it is important to keep track of how long you are working on something, because if you work at something too long, it is easy to lose track of time. If you’re like me, you also need to take some breaks on occasion to keep from going crazy. You also don’t want to be late for anything else you have going on later in the day. You don’t want to get bogged down with what you are doing. It is okay to take breaks. Check Facebook. Check Twitter. Reply to any emails that you have. That being said, make sure you close out those extra tabs when you get back to work so that they are not a distraction. You can even take a break from the computer itself and read a book or grab a snack. Tip #4: Switch things up. In order to keep things interesting, change the way you work once in awhile. Are you working at your desk? Move somewhere else like the couch or go to a coffee shop. Go to the library. Sometimes a change of scenery can get you fired up to get more done. It can also be helpful to use a different program if possible. If you are working on a paper in MS Word, try switching to Google Docs. Just don’t forget to copy and paste your work. Tip #5: Don’t force it. Even though I am a big proponent of getting things done ahead of time, I still believe that if you are not feeling motivated to do anything, you should listen to that. There are some things that you can fudge a little bit and do when you are less motivated, but most things you can’t do that. If you are working on a research paper and you are not feeling it, stop. Put it on the back burner for a few hours or even a day or two. In most cases, working when you don’t want to will lead to sub-par results. You don’t want that, because you will just have to spend as much time editing your work when you are feeling it. I hope these tips helped to give you ideas on how to be more productive when you are working online. Like I said at the beginning, I have had tons of experience, and so I like to think that I know a lot about how to be productive online. Always remember that if you just can’t stay focused online, that’s okay. You can download a program that will block certain websites for a set amount of time if that is what you need. Or, you can always be the crazy person who uses a pen and paper to do their work.